The month of December blew in this week with a tropical rainstorm. Wait a minute, this is New England, right? The following morning, the wind hurried the clouds along to reveal a brilliant blue sky and temps soaring up towards 70. Hmmm, New England? Today snow is in the forecast. Ah yes, New England. 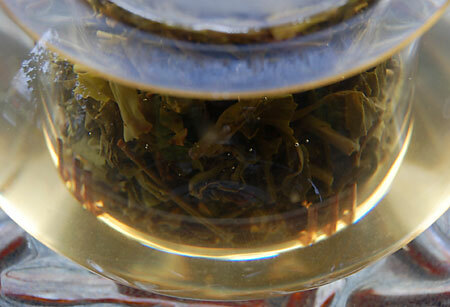 This morning I am sipping from a cup of green tea grown in the Northern Highlands of Vietnam. 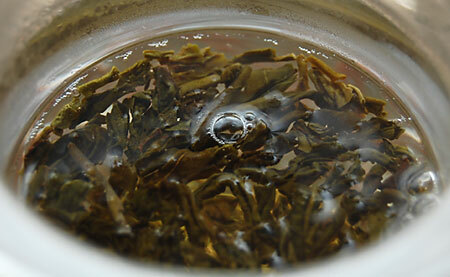 The tea is called Shan Tuyet Snow Green. As Vietnam borders Yunnan province at the north, tea trees have been growing wild there, as in Yunnan province, for thousands of years. More formal tea cultivation started in Vietnam at the beginning of the 20th century. You can read more about the history of Vietnamese tea growing here and here. I steeped the leaves for 3 minutes in 180 degree F water. As I lifted my teapot lid, a rich floral aroma wafted up from the leaves. 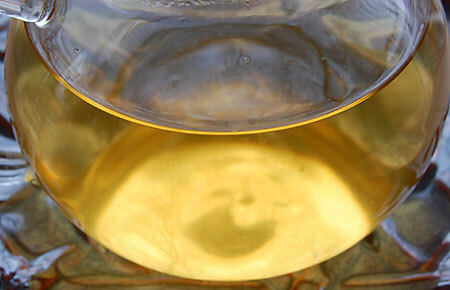 The liquor is a warm, buttery hue with a hint of fruit and malt in the flavor. I didn’t detect any vegetal quality at all, unusual for a green tea. 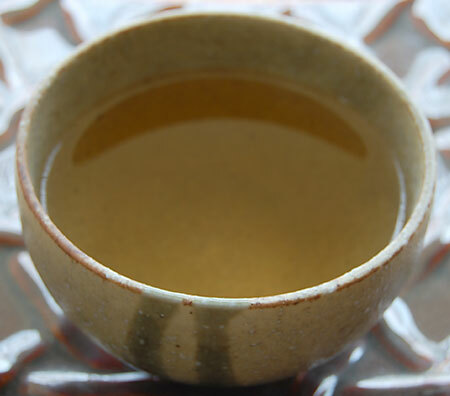 The cup is quite smooth with an interesting pungency which appears and then lingers in the finish. 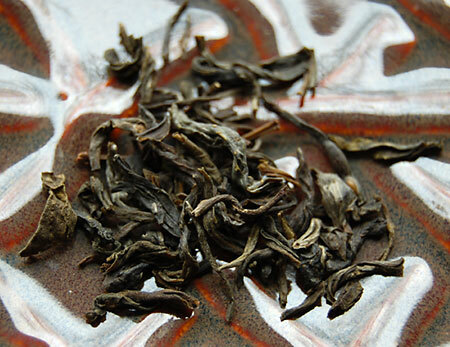 The dry leaf is highly twisted, only opening slightly when steeped. The wet leaf above is clinging to one of my Picasso marble stones. I love their striations. The liquor is crystal clear and quite pleasant as it cools. I am really enjoying my first experience with a Vietnamese green tea. Time for another cup! 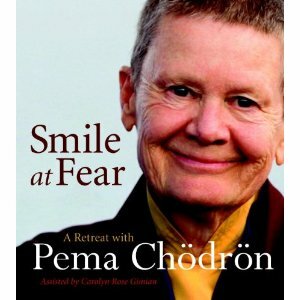 This entry was posted in Green Tea, Life Musings, Photography, Poetry, Stones, Tea and tagged tea review, Vietnam green tea. Love your marble stone accompanied with the beautiful color of the tea. I always seem to use the word “comforting” when I comment in your blog and I”ll use it again.. Your write up and tea does look so comforting. I am glad your first experience with a Vietnamese tea is a good one. 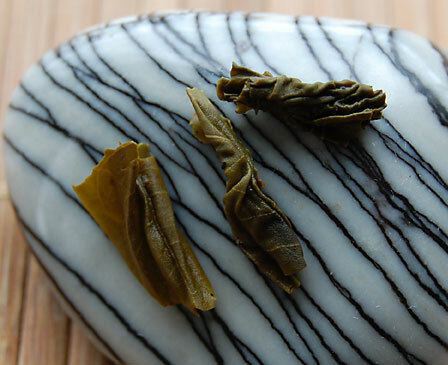 I hope you try the lotus tea (green tea infused with lotus flowers), a special Vietnamese tea – oh so aromatic.